Price predictions for the top 10 cryptocurrencies in 2019. 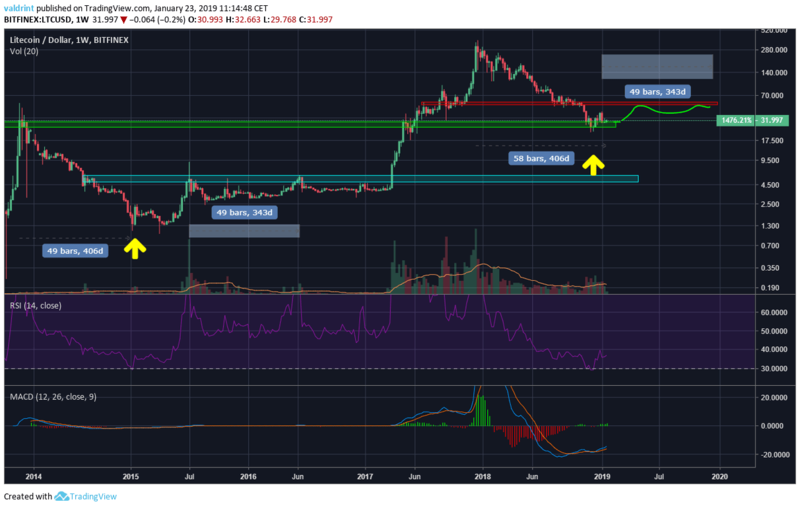 We take a look at Bitcoin, XRP, Ethereum, Bitcoin Cash, EOS, Stellar, Litecoin, Tron, Bitcoin SV, and Cardano and use technical analysis to predict where prices could go. A look at the Weekly chart for Bitcoin in logarithmic form shows that price is trading at $3600. Several similarities are noticeable between the 2014 “crash” and the 2018 one. I am going to make this prediction with the assumption that the recovery will follow a similar path. Firstly, we can see that the RSI is at the lowest point hitherto, at 25. Secondly, it took roughly the same amount of days (410) since the all-time-high for the price to record an 83% drop and the RSI to fall to 25. 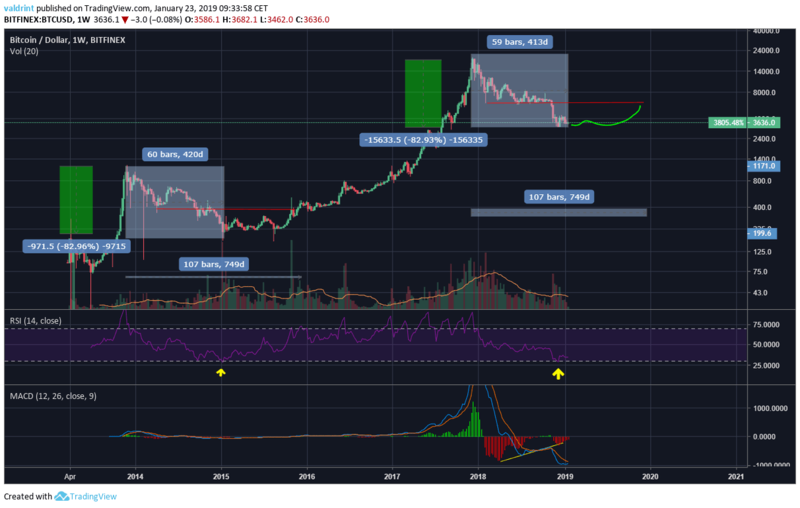 Therefore, I believe we are now in a similar position we were in at the beginning of 2015, denoted by the yellow arrow. Furthermore, we can see that the MACD is dropping but has lost all of its power, indicating consolidation in the market. 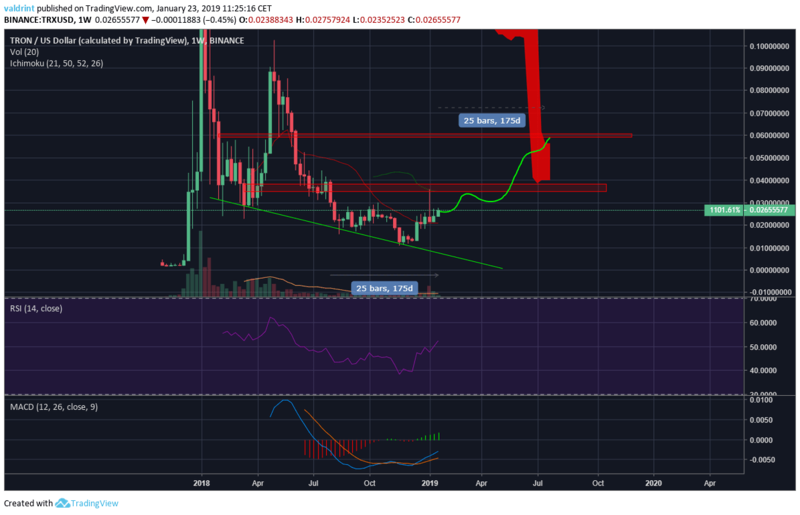 Given this information, I believe that price will reach a maximum of $6000 in 2019, doing so by consolidating for a while and eventually follow a path similar to the one outlined by the green line. 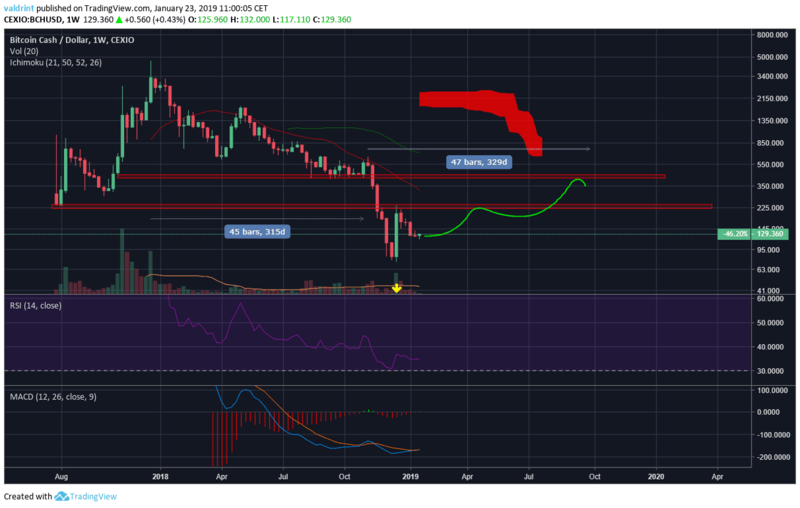 A look at the Weekly chart for XRP in logarithmic form shows that price is trading at $0.31 and gives us two possible future scenarios. We can see that price is trading in a symmetrical triangle and has been doing so for the past 230 days. Furthermore, the MACD has lost all of its power, and there has been virtually no movement for the past 6 weeks. The first support area is created by previous lows at $0.15, while the first resistance area is at $1.2 formed by previous highs and fib retracement lines. Given this information, I believe there are two price scenarios in play. I am operating on the assumption that the moves succeeding the symmetrical triangle will take roughly the same amount of time as the movement within the triangle (230 days). In the first one (green), price breaks out from the symmetrical triangle and follows the path outlined by the green line, eventually reaching $1.2. In the second one (red) price breaks down from the triangle and eventually heads to the support area at $0.15 where it consolidates for a period of time. The final prices on both scenarios will occur sometime around November 2019. 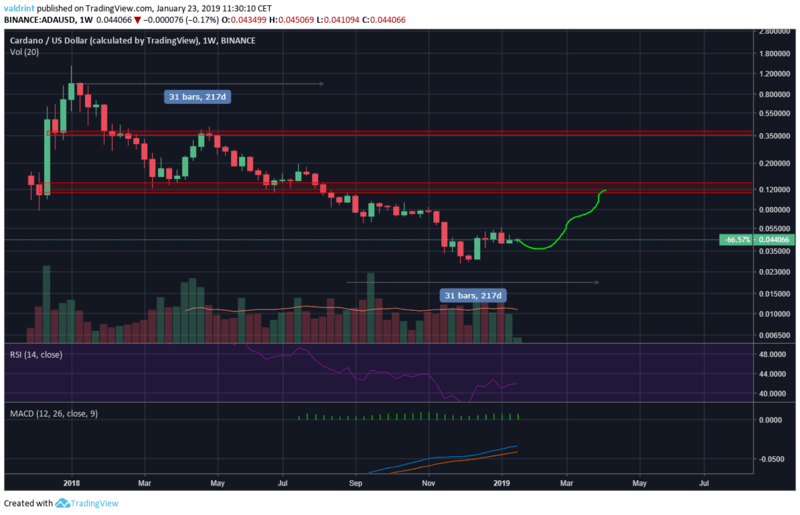 A look at the Weekly chart for Ethereum in logarithmic form shows us that price is trading at $120 below two areas of resistance. We can see that the RSI was below 30, indicating oversold conditions. Furthermore, the MACD has made a bullish cross and is going up. Given this information, I believe that price has bottomed and will start going up. Since the drop from $350 until now has taken roughly 180 days, the upward move should take a similar amount of time. 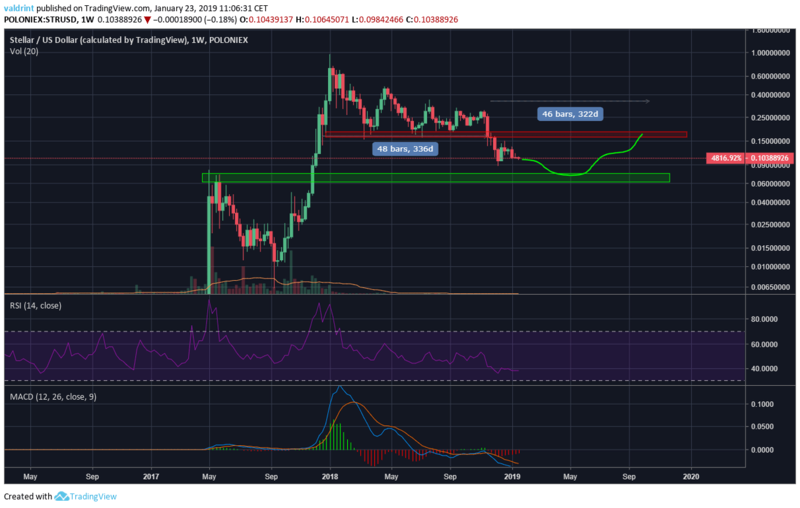 Thus, I believe that price will eventually break the $160 resistance and head for the major resistance at $350, before retracing and consolidating in between the two ranges. This move should last until August 2019. 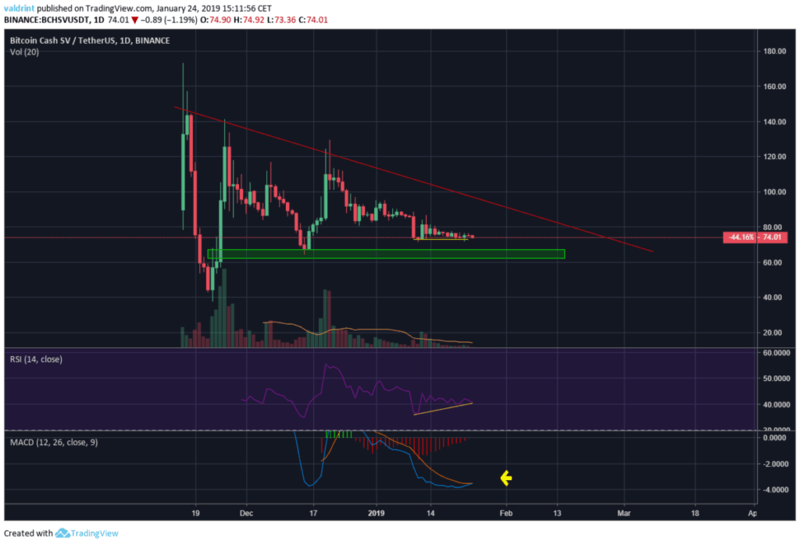 A look at the Weekly chart for Bitcoin Cash in logarithmic form shows that price has fallen below the major support area at $225 and is now trading at $130. The RSI was at 30, indicating oversold conditions and the MACD has just made a bullish cross and is ready to go up. However, the price is below both the 7 and 21 period moving averages. The time it took for the price to fall from the all-time high to below the support area at $500 was 315 days. Therefore, I am making the assumption that the move back upward will take roughly the same amount of time. I believe that price will eventually break the resistance area at $225 and move to the other resistance area at $500. This move should end in October 2019. 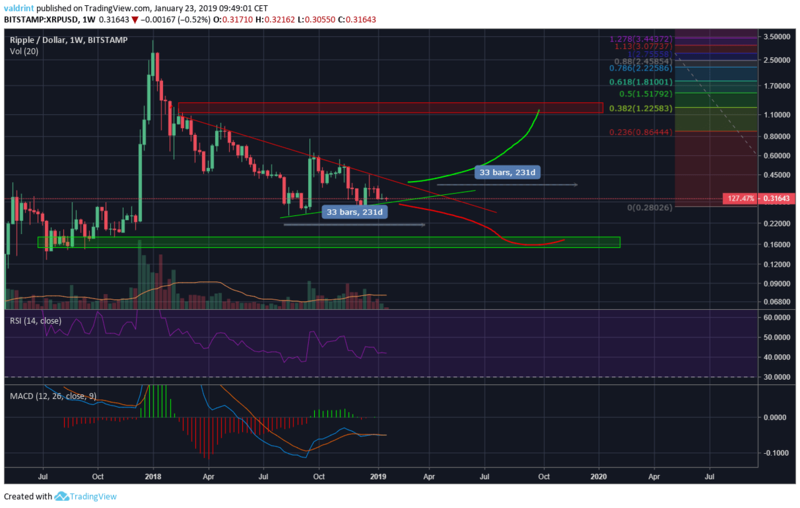 A look at the Weekly chart for EOS in logarithmic form shows that price fell below the resistance are at $3 then quickly came back and validated it as resistance. Price is trading below the 7 and 21 period moving averages. However, the MACD has stopped falling and is now ready to make a bullish cross. Since it took roughly 200 days for the price to fall from the all-time high to $4.5, I am making the assumption that it will take roughly the same amount of time for the price to move back to it. This would coincide with the possible support trendline forming (solid green line). Therefore, I believe that price will slowly move up to $4.5 sometime around July 2019. A look at the Weekly chart for Stellar in logarithmic form shows that price broke down from the support area at $0.16-0.18 (which now acts as resistance) and is currently trading at $0.1. The next support area is at $0.07. We can see that the RSI is at 40, indicating neither overbought nor oversold conditions. Furthermore, the MACD is dropping, albeit with less power. Finally, we can see that it took 336 days for the price to fall from the ATH to the support area at $0.16. Given this information, I believe that price has not bottomed yet and will continue to fall further until the next support area. 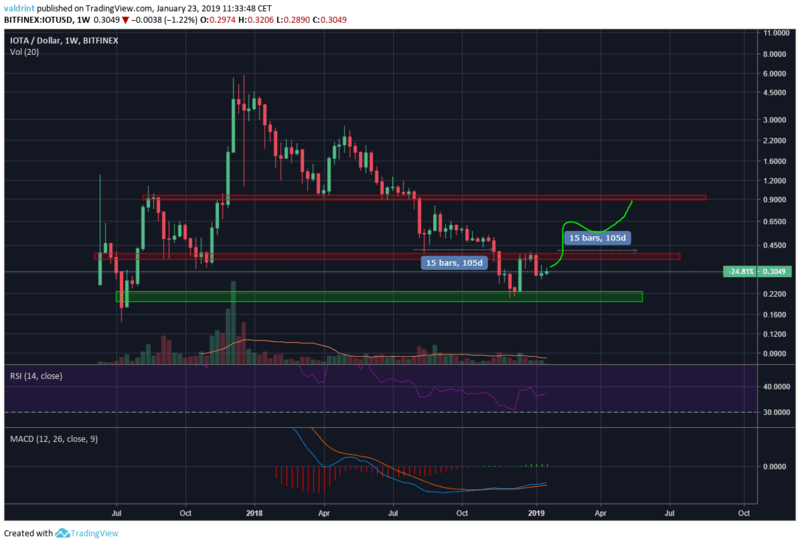 Afterward, the price will eventually make an upward move and reach the resistance area at $0.16 sometime in November-December 2019. A look at the Weekly chart for Litecoin in logarithmic form shows that price has fallen all the way to the support area at $0.25-0.30. The RSI was below 30, indicating oversold conditions. There MACD has made a bullish cross and has created significant bullish divergence. There are numerous similarities between the 2014 drop and this one, and based on the magnitude and length of the drop I believe we are now at the same point we were in January 2015 denoted by the yellow arrow. Based on this information I believe we will hit resistance at $60 during the summer, but fail to break it in 2019. A look at the Weekly chart for Tron in logarithmic form shows that price is following a descending support line and is currently trading at $0.027. The next resistance areas are at $0.035 and $0.06 respectively. The RSI is at 50, indicating neither overbought nor oversold conditions. However, the MACD has made a bullish cross and is almost positive. Price is above the 7-period moving average but is facing resistance from the 21-period MA and the Ichimoku cloud. Given this information and the length of the previous move, I believe the price will eventually break the $0.035 resistance, and head to the other resistance area at $0.06, which coincides with the Ichimoku Cloud. This move should end in September 2019. A look at the Daily chart for Bitcoin SV shows that price is trading at $74, near the support area at $60-65. Since the coin is relatively new and there is not a lot of data the longest time frame we can use is the daily one. There is some bullish divergence in the RSI, and the MACD is close to making a bullish cross. Given this information, I believe that price will make a move upward towards resistance at $100 by the end of February the latest. A look at the weekly chart for ADA in logarithmic form shows that price has fallen below all support areas, and the $0.11-0.13 area now acts as resistance. Price is currently trading at $0.04. The RSI is at $42, indicating neither oversold nor overbought conditions. The MACD is going up but not positive yet. 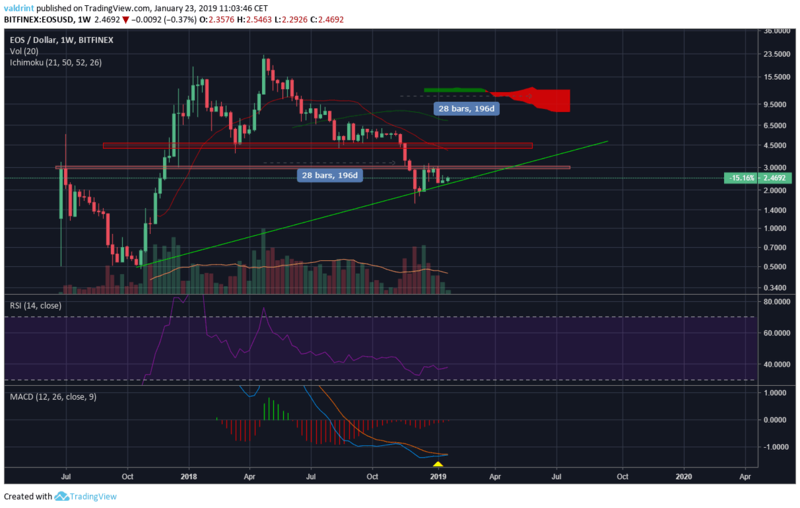 Given this information and the length of the previous downward move, I believe the price will make an upward move to the $0.11-0.13 area of resistance in May 2019. A look at the Weekly chart in logarithmic form for IOTA shows that price fell to the final support area at $0.2 and is currently trading at $0.3. The RSI is at 38, indicating neither overbought nor oversold conditions. Furthermore, the MACD has made a bullish cross and is moving upward. The next resistance areas are at $0.4 and $0.95 respectively. 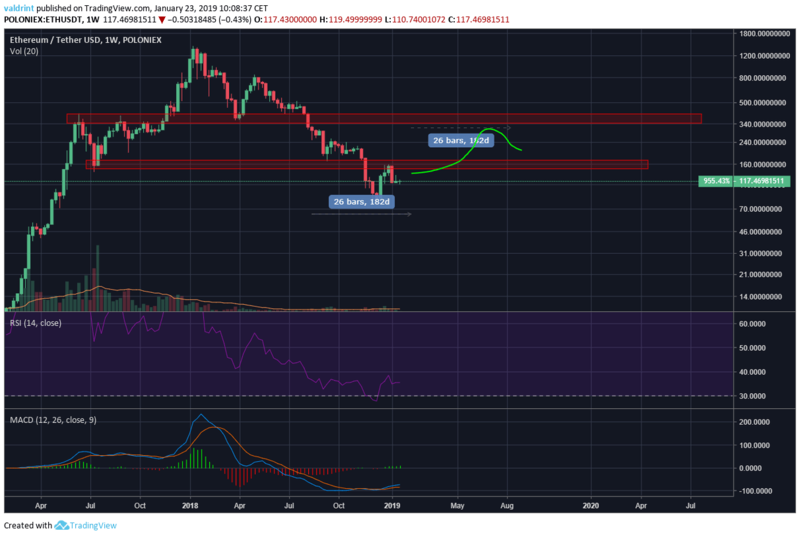 Given this information and the length of the previous downward move, I believe that price will break out of the resistance at $0.4 and move to the next resistance area at $0.9 sometime in June-July 2019.